The Adventures of Pinocchio (Italian: Le avventure di Pinocchio) is a novel for children by Italian author Carlo Collodi. The first half was originally a serial between 1881 and 1883, and then later completed as a book for children in February 1883. It is about the mischievous adventures of Pinocchio an animated marionette, and his poor father, a woodcarver named Geppetto. It is considered a classic of children's literature and has spawned many derivative works of art, such as Disney's 1940 animated movie of the same name, and commonplace ideas such as a liar's long nose. Pinocchio is robbed of his gold pieces and, in punishment, is sentenced to four months in prison. If the Marionette had been told to wait a day instead of twenty minutes, the time could not have seemed longer to him. He walked impatiently to and fro and finally turned his nose toward the Field of Wonders. "What if, instead of a thousand, I should find two thousand? Or if, instead of two thousand, I should find five thousand—or one hundred thousand? I'll build myself a beautiful palace, with a thousand stables filled with a thousand wooden horses to play with, a cellar overflowing with lemonade and ice cream soda, and a library of candies and fruits, cakes and cookies." Thus amusing himself with fancies, he came to the field. There he stopped to see if, by any chance, a vine filled with gold coins was in sight. But he saw nothing! He took a few steps forward, and still nothing! He stepped into the field. He went up to the place where he had dug the hole and buried the gold pieces. Again nothing! Pinocchio became very thoughtful and, forgetting his good manners altogether, he pulled a hand out of his pocket and gave his head a thorough scratching. As he did so, he heard a hearty burst of laughter close to his head. He turned sharply, and there, just above him on the branch of a tree, sat a large Parrot, busily preening his feathers. "What are you laughing at?" Pinocchio asked peevishly. "I am laughing because, in preening my feathers, I tickled myself under the wings." The Marionette did not answer. He walked to the brook, filled his shoe with water, and once more sprinkled the ground which covered the gold pieces. Another burst of laughter, even more impertinent than the first, was heard in the quiet field. "Well," cried the Marionette, angrily this time, "may I know, Mr. Parrot, what amuses you so?" "I am laughing at those simpletons who believe everything they hear and who allow themselves to be caught so easily in the traps set for them." "Do you, perhaps, mean me?" "I certainly do mean you, poor Pinocchio—you who are such a little silly as to believe that gold can be sown in a field just like beans or squash. I, too, believed that once and today I am very sorry for it. Today (but too late!) I have reached the conclusion that, in order to come by money honestly, one must work and know how to earn it with hand or brain." "I don't know what you are talking about," said the Marionette, who was beginning to tremble with fear. "Too bad! I'll explain myself better," said the Parrot. "While you were away in the city the Fox and the Cat returned here in a great hurry. They took the four gold pieces which you have buried and ran away as fast as the wind. If you can catch them, you're a brave one!" Pinocchio's mouth opened wide. He would not believe the Parrot's words and began to dig away furiously at the earth. He dug and he dug till the hole was as big as himself, but no money was there. Every penny was gone. In desperation, he ran to the city and went straight to the courthouse to report the robbery to the magistrate. The Judge was a Monkey, a large Gorilla venerable with age. A flowing white beard covered his chest and he wore gold-rimmed spectacles from which the glasses had dropped out. The reason for wearing these, he said, was that his eyes had been weakened by the work of many years. 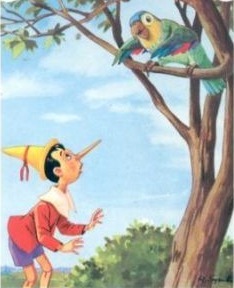 Pinocchio, standing before him, told his pitiful tale, word by word. He gave the names and the descriptions of the robbers and begged for justice. The Judge listened to him with great patience. A kind look shone in his eyes. He became very much interested in the story; he felt moved; he almost wept. When the Marionette had no more to say, the Judge put out his hand and rang a bell. At the sound, two large Mastiffs appeared, dressed in Carabineers' uniforms. "This poor simpleton has been robbed of four gold pieces. Take him, therefore, and throw him into prison." The Marionette, on hearing this sentence passed upon him, was thoroughly stunned. He tried to protest, but the two officers clapped their paws on his mouth and hustled him away to jail. There he had to remain for four long, weary months. And if it had not been for a very lucky chance, he probably would have had to stay there longer. For, my dear children, you must know that it happened just then that the young emperor who ruled over the City of Simple Simons had gained a great victory over his enemy, and in celebration thereof, he had ordered illuminations, fireworks, shows of all kinds, and, best of all, the opening of all prison doors. "If the others go, I go, too," said Pinocchio to the Jailer. "Not you," answered the Jailer. 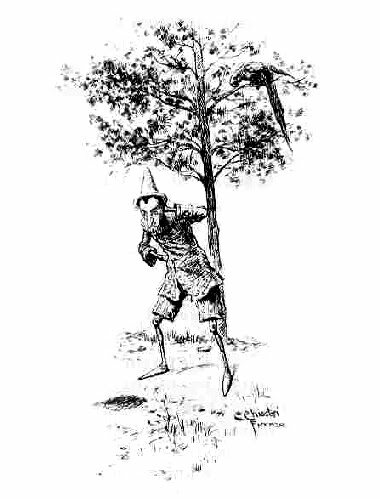 "You are one of those—"
"I beg your pardon," interrupted Pinocchio, "I, too, am a thief." "In that case you also are free," said the Jailer. Taking off his cap, he bowed low and opened the door of the prison, and Pinocchio ran out and away, with never a look backward. Robinson Crusoe on Denslow's "Mother Goose"